This is the first in a series of posts that will share some of the tools, techniques and processes I use in daily creative life. It's written for amateur enthusiasts like me who must fit their creative work within a full schedule of job, family and other ongoing responsibilities. One of the main challenges we face is a lack of contiguous time to work on projects. Instead of romancing ideas for days at a time in the crucible of an artist's studio, we ponder concepts while commuting to and from work, standing in line at the grocery store or even during previews at a movie theater. It's easy to lose ideas in such a hectic environment. 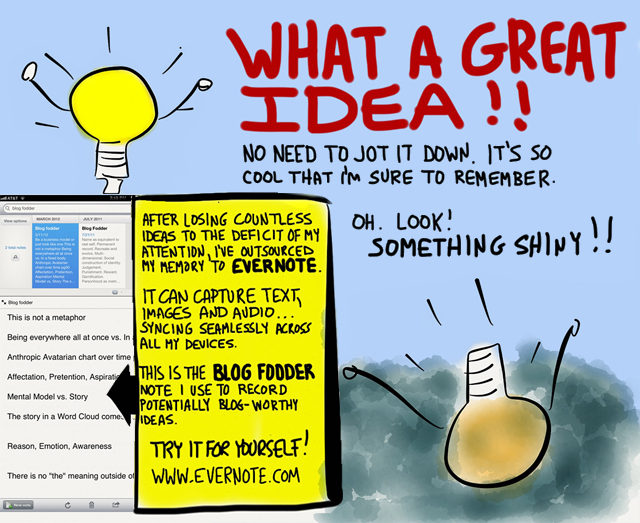 I've solved this problem by religiously capturing each emerging idea in Evernote. Since the software is on my phone, tablet, laptop and in the Cloud, it's always with me. I use it to jot down text, shoot photos of sketches and even record spoken notes while driving. I can come back to them at any time. It even OCRs images to enhance searching. Of course, you can also solve the problem by keeping a small notebook with you. I have stacks of them on the top shelf of my bookcase. The key step in either case is to record the idea when it's fresh in your mind. That way, you'll never have to mourn about the one that got away. I do the small notebook thing, but jot stuff in the iPhone's notepad when I forget. Or email myself the message and drop it in drafts. Used to use the Moleskine app because I could throw photos into it, but switched to Evernote for thecross-device usability of it. And then I found out how great it was for handling all the urls, notes, story ideas, pics and all the various ways I jot down things I want to think about later.